1 Preheat oven to 220˚C. Place pork in a large roasting pan, arrange apples around the pork and sprinkle with a little brown sugar. Roast for 20 minutes. 2 Reduce oven temperature to 190˚C and cook for a further 45-50 minutes until pork is tender and apples are slightly caramelised. 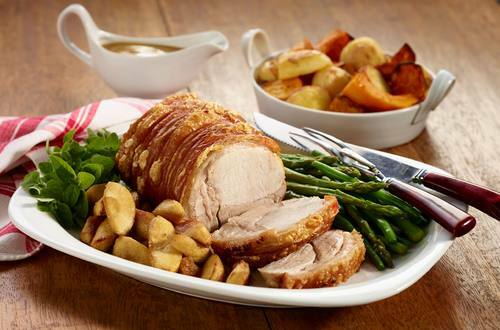 3 Remove pork and apples from roasting pan, cover with foil and allow to rest while making the gravy. Place roasting pan over medium to low heat, add the flour and stir well. Add apple juice, vinegar and water and stir continuously until thickened. 4 Serve pork and apple with roast potatoes, steamed vegetables and gravy.